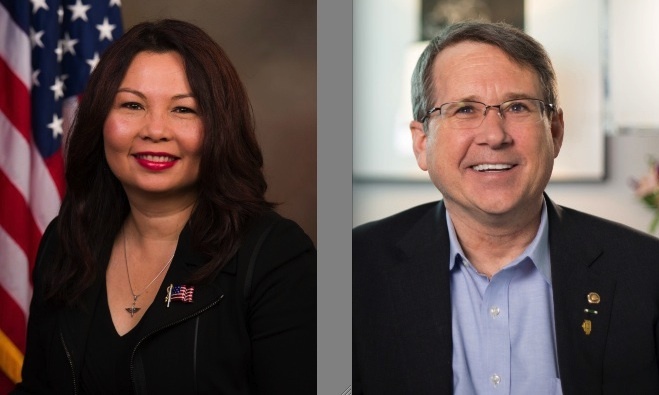 SPRINGFIELD, Ill. — Sen. Mark Kirk (R-Ill.) is under fire for a remark he made about his Democratic challenger, Rep. Tammy Duckworth, during a debate on Oct. 27. The tweet included a photo of Duckworth, who was born in Bangkok, with her late father, Franklin, a World War II veteran, and her mother, Lamai, a Thai immigrant of Chinese ancestry. ASPIRE PAC Chair Rep. Grace Meng (D-N.Y.) said in a statement, “Sen. Kirk’s anti-immigrant rhetoric against Tammy Duckworth’s heritage is inexcusable. Tammy is an American war hero who has served her country on the combat field, in the executive branch, and in Congress. I am appalled at his comments. ASPIRE (Asian Americans and Pacific Islanders Rising and Empowering) is a federal political action committee focused on supporting candidates of AAPI descent and those that support and promote the issues of the AAPI community. NBC News quoted Democratic Senatorial Campaign Committee spokesperson Lara Sisselman as saying that Kirk’s remark was “offensive, wrong and racist” and stating that Kirk exaggerated his military service on his campaign website, describing himself as an Iraq War veteran even though he only served in the Navy Reserves and was never deployed. “Sen. Kirk has been caught lying about his military record over ten times, but he was quick to launch false attacks questioning Congresswoman Duckworth’s family’s long history of serving our country. A struggling political campaign is no excuse for baseless and despicable attacks, and Sen. Kirk owes Congresswoman Duckworth and her family an apology,” Sisselman said.